Users: Workshop participants include university faculty and professional staff with little to no familiarity with an iPad. Users may have used other mobile devices like phones, e-readers or tablets in the past. Reading level and diagram reading skills should be ranked as high. 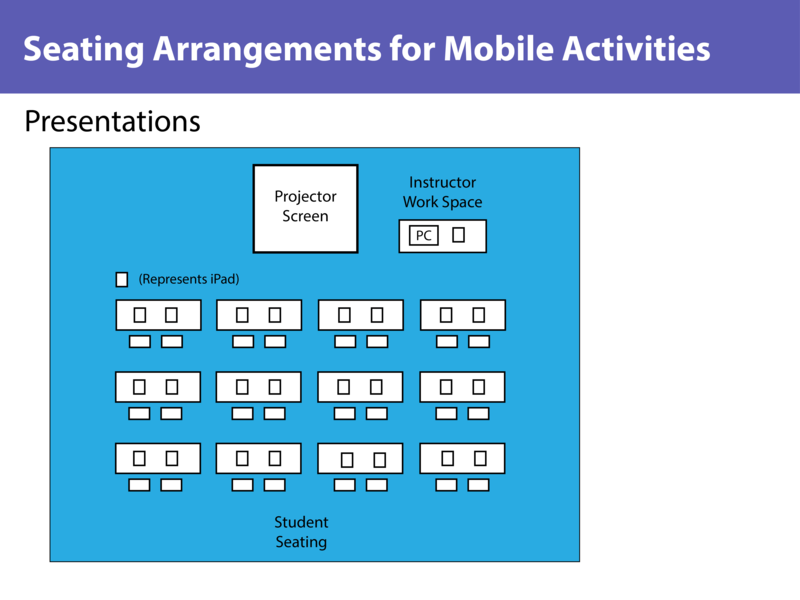 Solution: This graphic was created as an example for a workshop activity in which participants will design their own “mobile friendly” classroom layouts. Some activities that participants might want to consider includes: game show activities, group activities and lab-style activities. Reflecting on the concepts of white space introduced in Chapter 11, I used the principle of symmetry (p. 275) to create a sense of organization and cohesion and white space (p. 275) to illustrate items such as desks, seating, and iPads. Changes I’ll Make: I’ll add a “key” to this diagram that includes labels for iPads, tables and chairs. 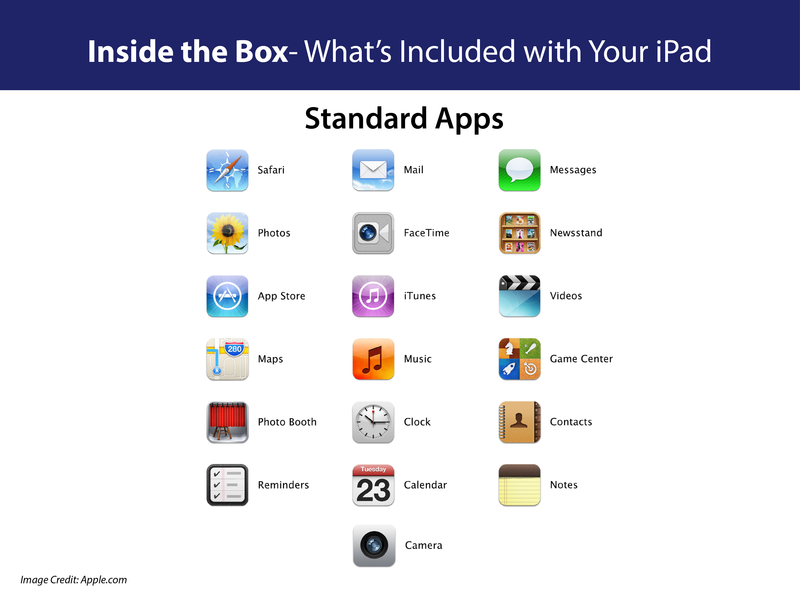 The organization of the “Standard Apps” graphic proved to be a bit tricky. Users should walk away with the sense that all of the apps are equally important and separate from each other. Using the concept of chunking (as discussed on page 148), I arranged the app icons so that they were evenly spaced and recognizable. 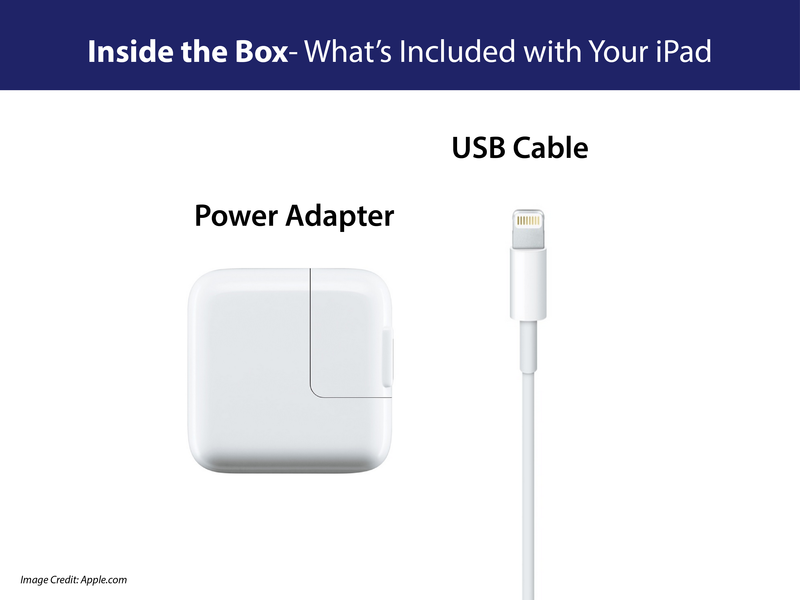 I also used chunking in the first graphic, separating the charger and USB cable so that they were close enough that they appeared related, but far enough apart that it apparent that they were two separate items. I also think labeling the two items helps to explain that they are separate. User-Test: After having a friend review the graphic, he shared that overall he felt the design was strong and minimalistic. One suggestion that he had was to further increase the size of the app icons and move their labels underneath the graphics. Changes I’ll Make: If I were to make any changes, I would increase the size of the app icons. 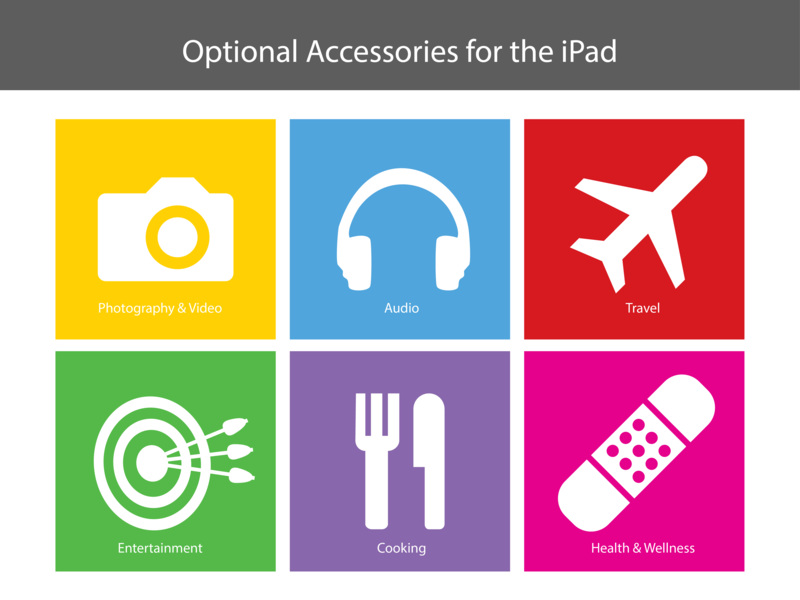 Solution: This graphic was created to be used in a class discussion regarding optional accessories for the iPad. Workshop participants will use this grid to help create an informational sheet about accessories they might like to use with their device. In creating the graphic, I selected colors that were of similar hues and saturation and a mix of primary and secondary colors (p. 264, p. 271). I selected white for the text and icons inside each box to maximize contrast and legibility. Eventually, a guide for third-party accessories may be created by the instructor for this course and she would use the colors portrayed here to categorize and highlight different items. User-Test: After having a friend review the graphic, he shared that he enjoyed the simplistic design of this graphic. One piece of feedback he provided was to consider making the text in each box a bit larger and change it to bold. Changes I’ll Make: The idea to increase the legibility of the text will help to improve legibility and is something I’ll add in my next rendition of the graphic.